In Algeria there are two major financial clans. There's the business clan, and there's the oil clan. The oil clan mainly lives off derivatives made from oil and gas products, while the business clan makes money from all sorts of business ventures. Until 2014, both the oil clan and the business clan were thriving. Both clans fed off each other, with the oil clan feeding deals to the business clan and the business clan feeding off the oil clan. But as oil revenues declined, the business clan was no longer benefiting from the help of the oil clan. The oil clan gradually pushed away the business clan and made sure the business clan was not involved in the political game. All key ministerial posts and army posts were attributed to the oil clan, and the business clan was not happy. The business clan was further beaten down when the oil clan decided to suspend import licenses to the business clan, while trying to push the business clan to export. While a handful of people from the business clan do export, a majority of people from the business clan lived off import licenses and selling imported products. As oil revenue declined, a big faction of the business clan, the construction clan, started losing revenue, as most construction ventures were halted. The oil clan remained in power, and did not care about the business clan's woes. Right now at the top of the government the oil clan is clinging to whatever power it can, while the business clan wants the oil clan out. The business clan knows that with only 40 billion dollars left in currency reserves, and no prospects of oil prices rising, the business clan is doomed to failure. However the oil clan was hoping for sanctions in Iran to see a rise in oil prices, which would bring back the much needed money back into the coffers. The business clan was irritated by such speculations and a war of clans started. 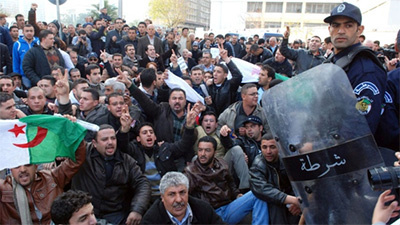 When the oil clan decided to present ailing President Bouteflika back for a fifth term, the business clan was irritated and mobilized the press to focus on demonstrations. While there had been demonstrations before February 22, the demonstrations were never covered by the press. This time, the business clan launched a widespread press campaign covering the demonstrations. The oil clan tried to give the business clan concessions, but the business clan considers those concessions too little too late. The problem is the oil clan has several powerful members in the army, while the business clan also has powerful connections in the army and the press. The oil clan has mostly been playing deaf and acting like nothing is going on, maintaining the government, while the business clan is trying to push the oil clan out. Eventually, the business clan wants to seize oil, and the business clan has lost a great deal of revenue over the last five years. First the oil clan has not paid the business clan for projects the business clan provided. Second, the oil clan froze all the business clan's projects. Third, the oil clan is not offering prospects to the business clan. So the business clan is trying to seize power, seize the oil money, and seize oil money while reviving business projects. So if the oil clan ever leaves the presidency, it will probably be the business clan seizing power.